For the Live Chef’s Challenge, the chefs had to draw knives to form three teams to create a whole meal using surprise mystery ingredients. 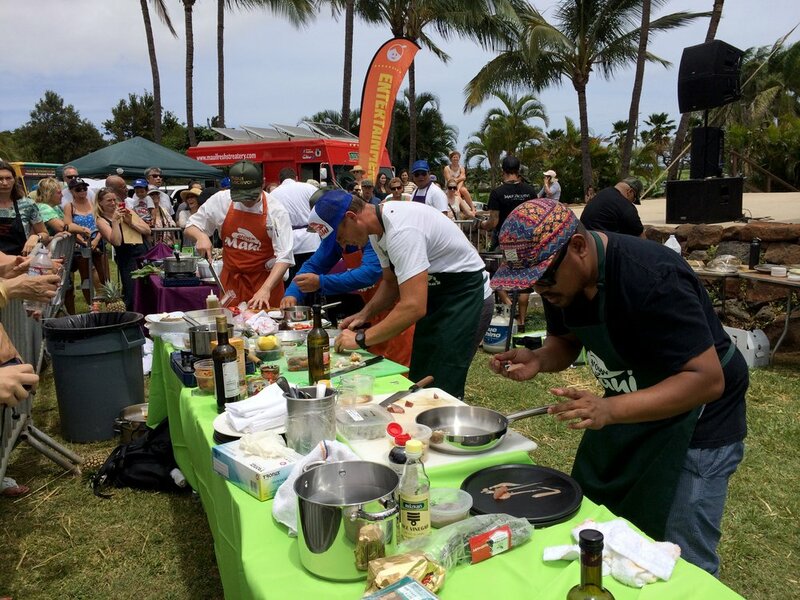 Chefs from Los Angeles, San Francisco, Orange County, and local Maui chefs all banned together for the fun challenge. Top Maui chefs Travis Morrin, Marcus Whisenant, Michael Lofaro, Ryan Luckey, Francois Milliet, Jeff Scheer, Sheldon Simeon, Isaac Bancaco and Jake Belmonte were joined by visiting celebrity chefs Oscar Torres, formerly of Acabar in Los Angeles; Seakyeong Kim of Charlie Palmer at Bloomingdale’s in Costa Mesa; and Richie Nakano, formerly of Hapa Ramen in San Francisco. After the knives were drawn to see who was on what team, the whistle was blown and the intense live cook off competition began! The chefs were spilt into three teams of four and they all made a mad dash to collect all the ingredients they could carry once they heard 'GO'! If you watch the video closely, you can even see someone getting elbowed in the face. The chefs had to prepare multiple courses using all the surprise locally-sourced ingredients with the limited food pantry and outdoor cooking equipment provided. 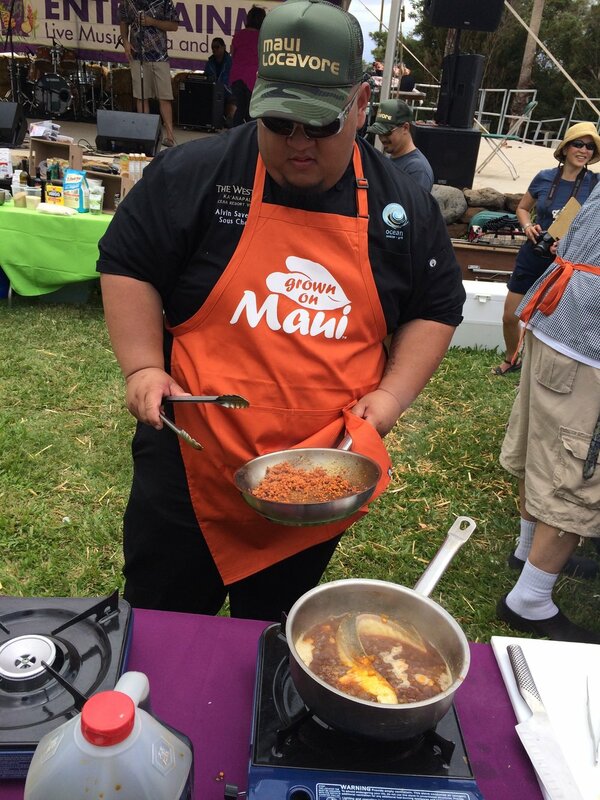 Each team only had half an hour to make three dishes, using a pre-selected selection of local Maui ingredients. How crazy was that? 30 minutes! Some standouts were: Chef Seakyeong Kim’s duck with duck liver and trumpet mushrooms, Chef Jake Belmonte's (instructor at the Maui Culinary Academy) creative and very kawaii octopus either taking a ride/attacking a prawn and noodles, Chef Isaac Bancaco's hamachi with strawberries, and Chef Sheldon Simeon’s hamachi dish. As the timer was counted down, my fellow judges and I were literally running to snap a picture, taste, and score each dish. Here's a peek at my judging sheet. After all the eating, judging, and tallying, Team Green (chefs Sheldon Simeon, Mike Lofaro, Jeff Scheer, and Oscar Torres) took home the prize! At this point, I had just finished having a huge lunch and had just stepped off the stage from judging 12 dishes prepared by all the chefs in the live cook-off. I had about two hours to kill before I was set to judge another 12 dishes in the Grand Taste event, where each chef had to make a dish spotlighting an ingredient grown by a local farm. So what did I do during my two hour break from eating? More eating, of course! Stay tuned for Parts 2 and 3 of my Maui Ag Fest Coverage! Check out my Hawaii arrival post! Big thank you to Charlene Kauhane to invite me as a guest judge for the event and a big, big mahalo to the Maui Visitors Bureau.